Howard �Sonny� Robertson was born on April 28th 1940 into a musical St Louis family. His mother Dorothy was a gospel singer, his father was a buck dancer in Vaudeville and his Godfather was Henry Townsend . As long as he can remember Howard has sung and his first professional gig was with gospel legend Willie Mae Ford Smith. His tenure with Willie Mae gave him the opportunity to sing in shows with the legendary Mahalia Jackson, Clara Ward, James Cleveland etc etc. Leaving Mrs Smith he joined gospel recording stars The Welcome Travellers wherein he sang first tenor and began playing guitar. This talented group included H. T. Liggins and Mac Hardin who found fame as Mel and Tim (Back Field In Motion) and other hits. He next joined up with childhood friends Charles Drain, Lionel Stokes, John Hopkins, Tuman Hughes and Leroy Terry who together made up doo-wop group The Tabs (Deejay Recording artists). Singing with The Tabs took him to the Apollo Theatre in New York in 1960 where he also worked stints with The Miracles, Flip Wilson, Red Foxx, Moms Mabley and The Isley Brothers. They also worked The Regal in Chicago and the Howard in DC. Returning home to St Louis he worked regularly in the local vicinity. On his free nights he would get together with another childhood friend, Jimi Hendrix, and they would trawl the local venues for inspiration. One night they walked in to an Albert King show and stood in awe of Albert�s playing. From then onwards whereever Albert played both of them would be there. He was eventually asked by Albert to play rhythm guitar at The Filmore. This helped Sonny find work with others including Matt Murphy, B B King, Koko Taylor, Buddy Guy, Lonnie Brooks and others too numerous to mention. Currently Sonny resides in Akron, Ohio where he has formed the Howard Street Blues Band and has recorded two CD�s; one live and the other for Travis Haddix�s label Wann-Sonn Records. It was the �live� record that prompted me to ask Sonny to join us in Castor and my recent acquisition of his �Kissing The Monkey� CD confirmed this decision. 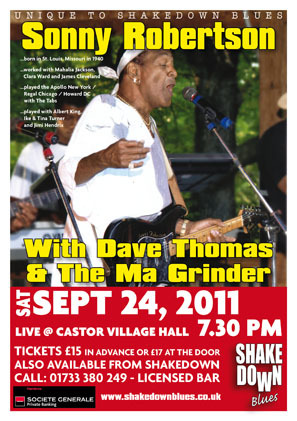 If you mix together Albert King, Stax Records and Albert Collins you�ll have the flavour of how this Saturday night in Castor will unfold.